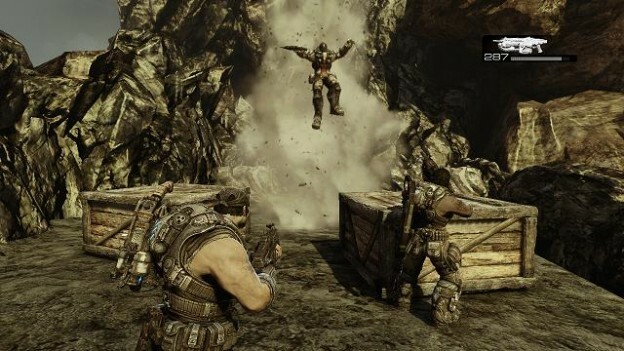 The gears of war 3 GUI is a very good example of a minimal interface that works really well. Whilst playing the campaign this is what you will see on your screen, just the weapon you currently have equipped, the amount of ammo you have altogether and how many bullets you have in the clip. Another thing you’ll see on the screen is that when you reload a little white bar goes across where the ammo is and if you hit reload again in a certain marked area you’ll do what is called an active reload and this will add bullet damage and reload your weapon quicker, this allows the player to interact with the GUI. You change weapon with the D pad and it comes onto the screen in the middle and shows you each weapon you have in each slot but you can continue you run around while you do so. 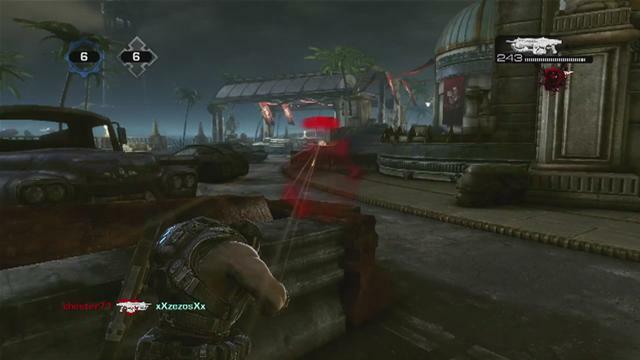 When you take damage online or single player a picture of the gears of war logo will come on the screen and the more intense red it gets the more damage you have taken, this is in place instead of a health bar but it also shows which direction you are taking damage from. The GUI does change when you are playing multiplayer, depending what game mode you are on you will have the score in the top left hand corner and when a player dies it shows it in the bottom left hand corner. I’ve always liked the GUI’s for the gears of war games because there isn’t too much going on to divert your eye from the gameplay and i think the way it looks when you take damage is very clever.